Throughout August I am featuring some of the fabulous women with whom I am privileged to work. Here’s Jo Gifford, in her own words. Hi, I’m Jo and I mentor solopreneurs to work smarter and to get their killer content out to the world. I am a mum of amazing twin girls, I am an artist, violist, mojito lover and bookworm. 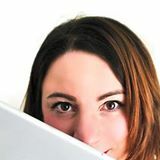 My business is called The Dexterous Diva, which began life as a blog documenting my world as a self-employed mum in the creative industries living, working and winning with chronic illnesses. I then built up a following and an audience, and began to offer mentoring to other solopreneurs. I have been self-employed since 2006, but business in this form has only been going since autumn 2013. I work with solopreneurs, usually women although guys are welcome too, and I absolutely love helping them to work in ways that free up their time whilst getting their message out to the world via social media and blogging. I am passionate about the power of blogging for business, and about working as a self-employed mum; the freedom it gives me to run my own ship and to be able to work from anywhere is such an honour. I have learnt so much along the way, and I am always soaking up new knowledge. It’s ok to say no to clients who are a bad fit even though you may need the money, and it’s ok to charge more! I am always growing and changing, but being an internet business owner and solopreneur has given me so much confidence, freedom, and financial ability that I want to share knowledge with others. The thing I am most looking forward to is running my next round of Blogging for Business Bootcamp, and being able to take August off to be with my family. Jo is a member of my Coaching Club 100. Join during August and save 50%. Swell the ranks of our fabulous group of women for a very affordable £100 a month. Prices rise on 1st September 2014 so now’s the time to join.